Our Le Bella Donna bride for today is Jess. Jess got married to her husband Adam this summer in a lace and tulle convertible gown from Stella York. This two-in-one dress provided a sophisticated, detachable full skirt for the ceremony and a lovely lace sheath with an illusion back for the reception. 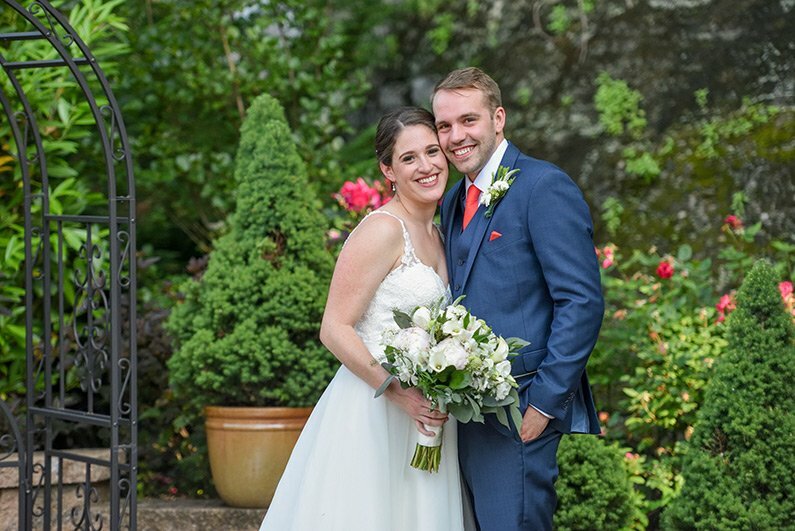 Jess and Adam met in their freshman year at West Chester University. They were in the same friend group throughout college and spent a lot of time together as friends before they began dating. The couple dated for eight years and then got married. Adam and Jess knew that they both wanted an intimate proposal, not anything too big. Adam proposed in their home one Monday when Jess got home from work. He had cleaned the house and decorated it beautifully with roses and candles. Jess began looking for her wedding gown with an open mind and not looking for a particular style. She knew she liked lace, but was willing to try all different types of dresses. She tried only about ten dresses before she found her perfect one! Jess and Adam’s wedding had quite a few international guests. Adam grew up in Australia and some of his family was able to attend the wedding. Jess has friends from Namibia and Germany who also flew in for the big day! Jess’s favorite part of her wedding was at the reception. At the end of the night, people cheered to the DJ “One more song!” and he actually did play one more song! She loved how everyone danced the night away and is still receiving compliments on how amazing her wedding was. The advice that Jess has for other brides is to not stress about the little things and to delegate tasks to others when needed. Family and friends want to help you with your wedding so it is okay to ask them for assistance! Congratulations Jess and Adam! We wish you many years of love and happiness together!